My sister, during her growing years, made many trips to the dentist to get her baby teeth pull off. No, they were not loose or rotten. In fact, her teeth were too strong that the dentist had to extract them to accommodate her new, sprouting teeth. Even until now, ikan bilis powder brings fond childhood memories. Once, I announced to my family that I’ll make ikan bilis powder to flavour congee on busy days; they laughed and reminded me “You’re not a baby anymore!”. So I put the idea off until I read about DIY instant noodles. I needed to create a healthy, savoury flavouring. What can be better than high-calcium ikan bilis powder? Step 1 PREHEAT OVEN: Preheat the oven to 180 ºC. Step 2 RINSE: Rinse ikan bilis (anchovies) once. Do not do it too many times as we want to retain the saltiness and umami flavour of the ikan bilis. Step 3 DRY: Meanwhile, place rinsed ikan bilis on a layer of paper towel to have excess water absorbed. If you have time, you can air dry them. Step 4 BAKE: Spread ikan bilis evenly on a tray. Your oven should be hot already by now. Bake in the oven for about 10 minutes or until they turn light brown and crispy. As one oven vary from another, do check and ensure they are not over-baked/ burned. Mine turns out just right at 10 minutes mark. However, a little longer and they could be burned. Step 5 GRIND: Grind baked ikan bilis in a grinder/blender until they turn into powder. 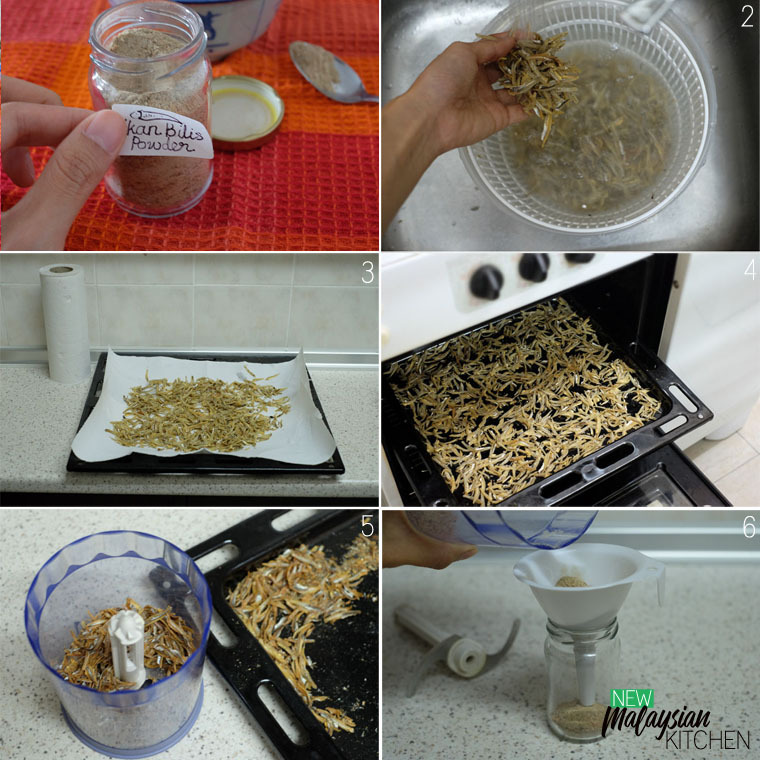 A powerful grinder will only take a few seconds to turn crispy ikan bilis into specks. You can also use a pestle and mortar, though it’ll take a longer time. Step 6 STORE: Store in a clean, dry and air-tight container in a cool and dry place. You can store it in a fridge or freezer – it’ll last much longer. Bake 2 cups of peeled ikan bilis in oven @180C until crispy (10 min). Grind in blender until it turns into powder. Store in dry, air-tight container. One baking tray that measures 13 x 14 in can accommodate 2 cups of peeled/halved ikan bilis (one layer). If you are busy, buy peeled ikan bilis. I never do otherwise. It takes too much time and patience to remove the innards. Normally, I would visit a seafood specialty store (My favourite is one in Kuantan where I go a few times a year) and pay a little more for those which are already cleaned. I bought 500 g of peeled ikan bilis at RM 19. Hence a bottle of ikan bilis powder made from 100 g of ikan bilis cost about RM 3.80. 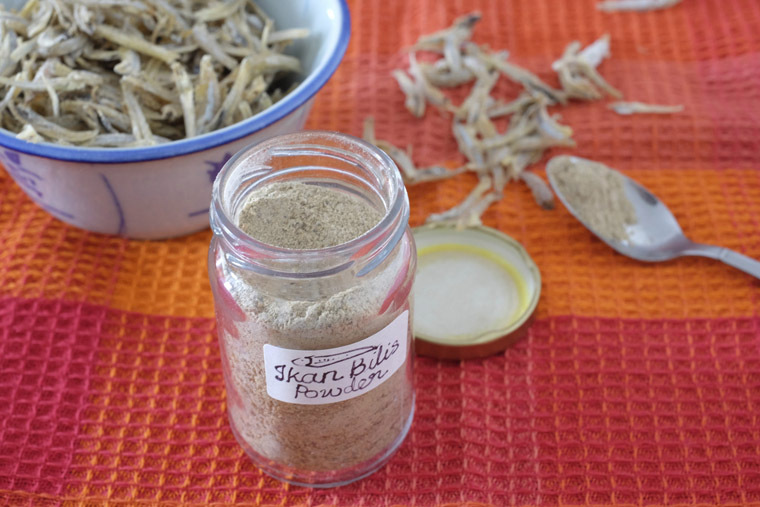 So it looks like ikan bilis powder is not only good for babies, but for busy adults who try to eat better. Do try to make a bottle. It’s delicious, handy and good for your bones! 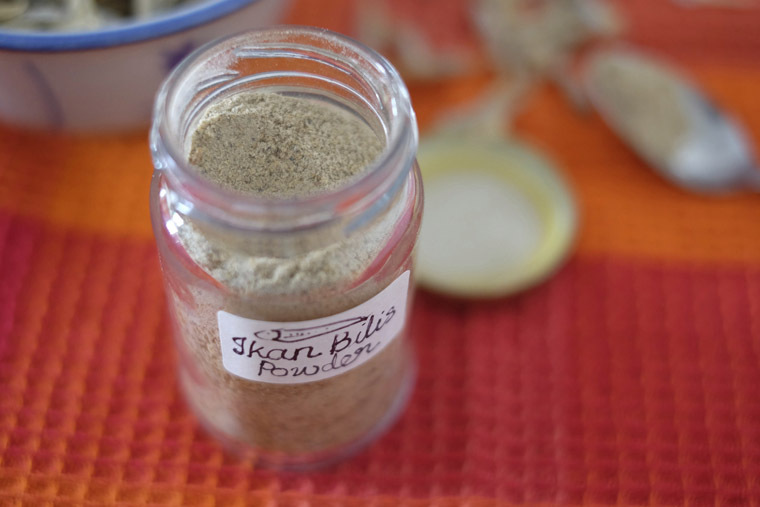 Have you made ikan bilis powder before?